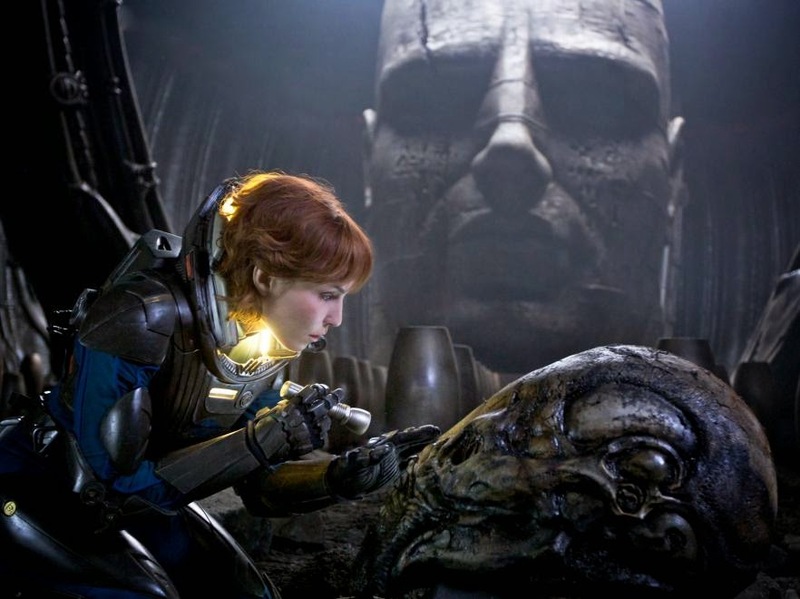 I’ve watched the movie Prometheus twice in as many days. I did something the second time around which I’ve noticed doing before while watching movies, and it struck me that the implications are pretty interesting. There is a scene in Prometheus in which the characters attempt to outrun a giant sandstorm on an alien world. Toward the end of this high-octane race against a lot of dust moving really fast (outrunning walls of stuff moving fast is a staple of recent action movies), one of the central characters drops a very important, probably fragile, specimen off the back of the buggy she is riding (and since she had not been established as an incredible klutz, I suppose it was simply a plot device to put her in more danger). So, she jumps off the buggy, grabs the bag with the specimen in it, and gets hit full on by the sandstorm. In the midst of people yelling and wind howling, they rush to save her and get her inside the ship. millions of miles who proceeded with caution and care. But, apparently not. Now, what happened during this scene (at least the second time) was that I simply got up and walked away. I think I wanted a drink or a snack or something. Then, while I was in the kitchen, I realized I would miss something, namely, who saved her. I didn’t see the CGI dust particles, or the stunt doubles getting slammed against things, but it did not seem like missing anything to miss those. I didn’t care about missing the action; I cared about missing the act taken by one character in regard to another, because that sort of thing furthers and constitutes the story. And, really, that is the fundamentally interesting part of a movie. Thirty seconds. Now, you might say that this act really took six minutes, because without the sandstorm, there would have been no danger from which one character could save the other. True, but they could have done the same thing with a collapsing floor, or a roof caving in. It needn’t have taken nearly so long. You might also accuse me of being stingy and a little robotic about time in movies, breaking it down into percentages and what not. This is art after all, damn it! Exactly, it’s art. We’re building these little worlds and histories, and we’re presenting them in a fundamentally temporal medium. The relative length of different parts of a film, the rhythm established by the kinds and arrangement of the scenes, this all makes a difference. And something that is mostly spectacle is just that, spectacle; something to look at, not to think about. And, in the case of Prometheus especially, this is a disappointing misuse of an idea. The premise of this movie is interesting, some of the relationships and characters are as well, but what it needed was a film maker with the courage to make a movie about acts rather than action, a movie where people investigate and talk and argue, help and betray, plan and carry out. You know, human stuff. A movie like that has a chance to show and tell us something about the mysteries of the world of the movie, in the limited time we have to see and hear, rather than tantalizing us, provoking us, and then having tentacle monsters jump out and say, “Boo!”, and sandstorms bear down and go, “Woosh!”, and characters run around doing more or less incomprehensible things, leaving us frustrated in our attempt to understand. Not that I object to tentacle monsters, they can be pretty gross and awesome, but they should further a story at the same time. I often have a similar problem with kung fu movies. Speaking of which could you watch and write about a movie called Dynamite Warrior? I can't wrap my mind around it simply because of how confused the plot is along with the English voice overs and the strange feeling that the movie didn't leave me with anything coherent to think about. If you mean the Thai movie from 2006 that received very mediocre reviews, then I accept.